Survival is a universal theme, and as a dramatist, there couldn’t be any more stakes in a man fighting for his life. DETOUR started out as an experiment in the simplicity of filmmaking. Why keep it simple, you may ask? Well, it’s survival instinct. How does one survive in a town [Hollywood] that is purported to eat its young and go back for seconds? Some of you may take that statement literally, some may view it as a metaphor for high-concept fare that overshadows independent films and, in doing so, sparks an endless number of sequels; either interpretation is fine. My writing partner, Dwight, came up with the idea of a man trapped in a basement after his house in the hills gets besieged by a landslide. That was the beginning. It was something we could afford to do, outside of the Hollywood machine. I needed to make a film, that’s what I came to LA to do, and I wasn’t going to wait for anyone, or any institution, to give me permission to do just that. Writing DETOUR, something I could go out there and make myself, gave me all the permission I needed. With that in mind, there is a lot of me in DETOUR’s Jackson Alder. Jackson must learn how to survive on his own in a world that’s most certainly not on his side. He’s got to fight hard against the antagonistic world of unpredictable natural disasters, to persuade the ground to move in his direction, but if he can’t convince the earth to swing its vote, well, he has no choice but to dig his way right through it – even if it means certain death. One of the driving motivations in making this film was simplicity – minimalism in its storytelling, but not necessarily in its filmmaking – and I felt strongly that the life or death stakes should be more immediate than the original concept would allow. 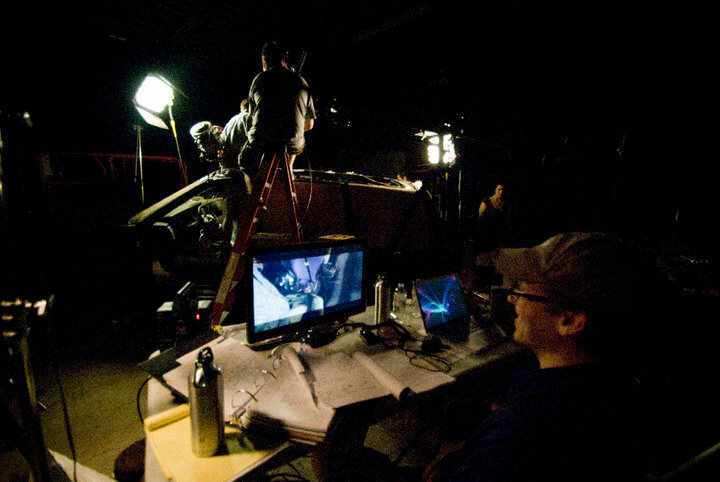 That lead me to introduce a smaller location into the situation – a smaller location also meant a smaller budget, which as an indie filmmaker was incredibly important to getting the wheels spinning on the project. I’ve always been drawn to minimalist art and entertainment; specifically, the execution of it, the DIY ethos that so often fuels it, and the aesthetics of the final product. My first short film involved a man alone on his deathbed, the pinnacle of solitude, which depicts a flashflood of memories linked together by his last word: “F**K.” I made a film in school that was inspired by Stephen King’s short story “Survivor Type,” which is about a fleeing criminal who goes mad in the desert and eats himself to survive. The last short I made, SHADOWBOX, which won “Best Short” at the 2008 Shockfest Film Festival in Hollywood, is about a man who watches the film of his own interrogation, and subsequent torture, as a means of coming to grips with the questionable choices he made while at war and putting those choices behind him. Needless to say, the idea for DETOUR was a brand new world of thrilling isolation that I just knew I had to explore and make into my next film. One character, one location…and this character could be you. 5 years later, we finally have a movie, a movie steeped in the blood, sweat and tears of the cast and crew who risked life and limb to make it a reality. And when I say life and limb I mean that literally; just ask Neil Hopkins, who played the role of Jackson Alder – he barely made it off the set alive. DETOUR hits Theaters, iTunes and On Demand on March 29th, 2013. Check your local listings.